[Jesus said,] "For just as the Father gives life to those he raises from the dead, so the Son gives life to anyone he wants." Death was our impenetrable barrier as mortals. We could not escape it. We could not go around it. We could not see beyond it. Then the Father sent his Son, Jesus. Jesus conquered death. Jesus destroyed it as our barrier. He showed us what is on the other side of death. 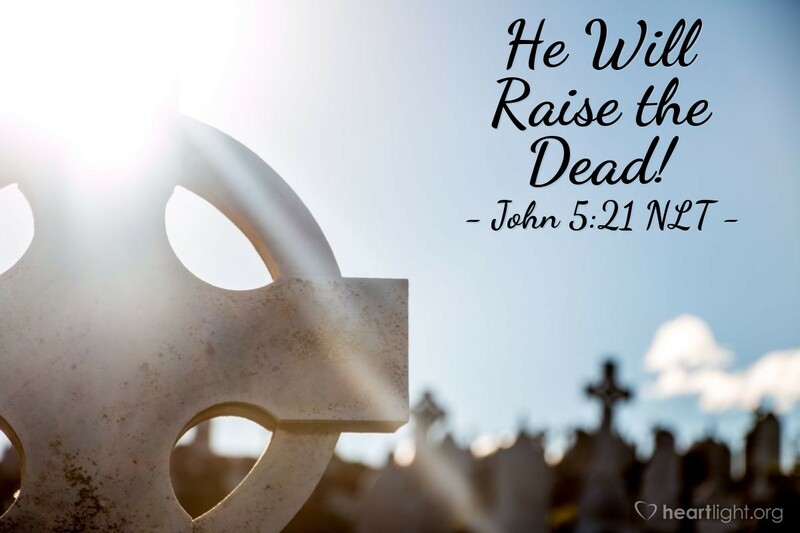 Just as surely as the Father raised Jesus from the dead, Jesus will also raise from the dead those who love him. He has promised it. He has demonstrated it. He now longs to do it, and one day he will raise the dead. Then, as God's children, we will experience his glory firsthand. Father, thank you for not letting death have the final word. Thank you for demonstrating your power over our death through Jesus' resurrection. Give me the courage to live with conviction and faithfulness knowing that my life will not be claimed by my death, but by my Savior, with whom I will live and reign forever. In his name, Jesus Christ my Lord, I pray. Amen.